Jennifer Brown is one of my favourite Young Adult Authors! She takes real life situations and pens them with realistic characters. What I love most about Brown is she takes situations that are normally sugar-coated and delivers that with raw intensity; Like Sexting, bullying, teenage domestic violence, the aftermath of a tornado. To me, she belongs along side the literary icons. To me she is a Literary icon! Torn Away was an absolute heart-wrencher. There were moments that I could just barely keep reading. Knowing that families deal with Natural Disasters just like tornado's and lose everything in it's wake. At times, I couldn't even fathom the pain that Jersey was experiencing. The emptiness and void she had in her heart was obvious throughout the entire novel! This novel also surfaced a lot of anger out of me. I just wanted to slap her Biological father silly. What a horrible man. Anytime he entered the scene my blood pressure immediately went up! And those Twins! My god, what little brats. Okay, Okay that's it for my venting. But seriously when you read this(because you'd be insane not to read it) be prepared for that peachy group of people! I absolutely loved Jersey, her character reminded me a lot of a friend I had, so reading through her pain made things a little bit harder. There were moments I just wanted to give her a big hug! On that note, there were also moments that she irritated me a little bit. Like her attitude towards her grandparents. I found it to be a a bit harsh and over-dramatic at times but thankfully, she redeemed herself. 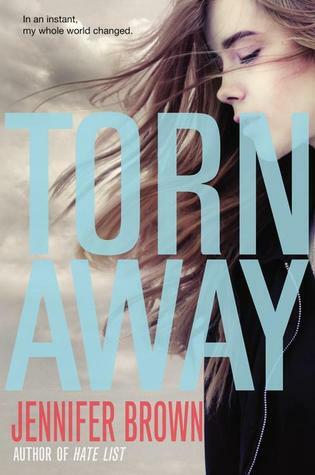 Torn Away was everything I expected and more from Jennifer Brown. There is not one single book of hers that I don't love. I love revisiting her previous work while I eagerly await her newest releases! The winter is officially here so I need to buy more books to survive through this cold. Thank you for your recommendations, it is always a pleasure to read your reviews.